TorontoVerve. :: TIFF 2012: Rachel McAdams & Director Brian De Palma "Passion"
TIFF 2012: Rachel McAdams & Director Brian De Palma "Passion"
Brian De Palma's Passion is a remake of Alain Corneau’s thriller Love Crime, a story of a ruthless business executive (Kristin Scott Thomas) who takes credit for her naive assistant's (Ludivine Sagnier) ideas, setting the stage for all-out war. In Passion, De Palma follows the same premise. Rachel McAdams (Mean Girls, The Notebook) plays Christine, the unscrupulous business executive who regards stealing her employees' ideas as standard practice. Noomi Rapace (The Girl with the Dragon Tattoo trilogy) is Isabel, her talented assistant and ideas person. When Christine takes credit for Isabel's innovative cell phone ad, she begins to steadily climb the corporate ladder. Determined to control her own destiny, Isabel subsequently makes a risky business move that quickly puts her in the spotlight and stalls Christine's promotion. Inevitably, war is waged and someone ends up dead, but that's only the beginning. 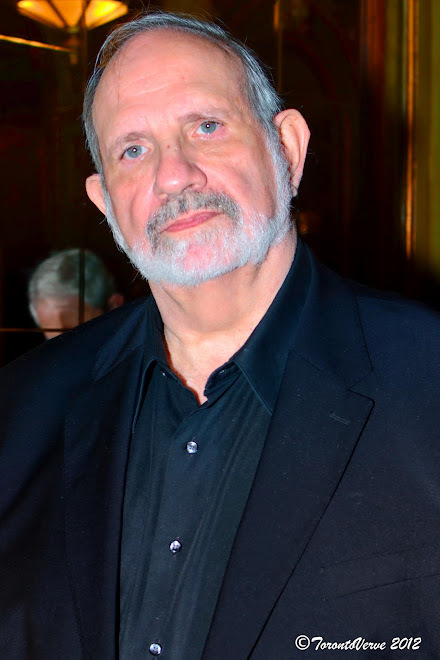 Passion is a reminder that De Palma (Carrie, Scarface) is a master in his craft. The film is wrought with twists and turns that will leave you guessing -- "who done it" -- to the very end. The pairing of McAdams and Rapace is superb. McAdams is convincing as the evil Christine and Rapace is a surprise as the wicked Isabel. If you love Hitchcockian thrillers, then you shouldn't miss Passion. Passion will be released sometime next year.